This past week, the “Devoted Friends of Pride and Prejudice 2005″ and the “Pride and Prejudice 05 Blog” highlighted this post. I thought I might repeat it here because tomorrow, September 16 is the 10 year anniversary of the release of the Joe Wright film in Europe. By the way, the P&P05 blog has a variety of events going on this month in celebration of the anniversary. Check out all the discussions going on. In a previous post, I discussed how Andrew Davies “created” the image of a very masculine and virile Darcy by adding scenes to the 1995 Pride and Prejudice adaptation. Some of you reading this post likely participated in “Darcy Loving Parties” at the time of this mini-series’ release. 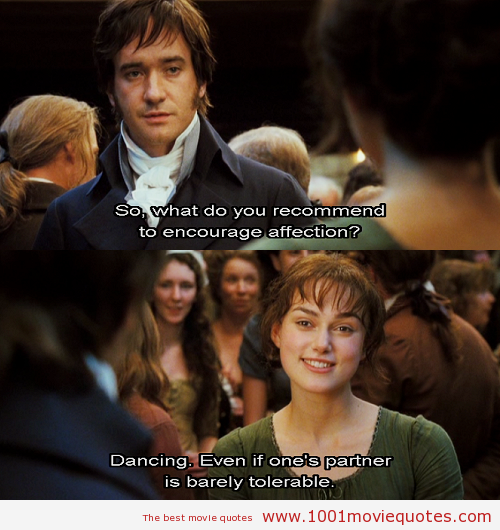 Today, I would like to examine the visual shift of “desire” to Elizabeth Bennet in the 2005 film. Casting the beautiful Keira Knightley in the lead role changed the focus. Choosing Ms. Knightley, who established herself in Bend It Like Beckham, King Arthur, Love Actually, and The Pirates of the Caribbean, was designed to appeal to a younger and wider audience. Add Joe Wright’s emphasis on social realism to Knightley’s casting, and we have a film that grossed over $125 million worldwide. Knightley’s casting could have backfired. Remember that Austen describes the character as, “She (Elizabeth) is tolerable, but not handsome enough to tempt me.” and “But no sooner had he made it clear to himself and his friends that she had hardly a good feature in her face ….” and “Though he had detected with a critical eye more than one failure of perfect symmetry in her form ….” Obviously, the casting of the equally lovely Rosamund Pike as Jane helped to “sell” the idea that Elizabeth’s fair face was less than her elder sister’s. In the 2005 film, Elizabeth (Knightley) is found in EVERY scene, from the opening shot of her walking home while reading her book to the final kiss in the American version. The camera follows Elizabeth through the house. We see her world through Elizabeth’s eyes. When she walks away from Darcy at the Meryton assembly, everyone else pales, but our focus remains constant on Elizabeth. She is framed by the retreating camera lens. When Elizabeth and Jane share secrets under the blankets, the audience is invited to join them. When she sensually traces Darcy’s belongings with her fingertips, we feel Elizabeth’s longing for a man she has allowed to slip through her fingers. Through the camera, the viewer is always at Elizabeth’s side. We read over her shoulder in the opening scene. We enjoy the interplay between Elizabeth and Mr. Bennet regarding Mr. Collins’s pomposity. We hide behind a Netherfield column with her when her family’s actions bring humiliation. We observe Darcy’s approach through the morning mist as Elizabeth would, and we peek through the open door as she watches Darcy spin his sister around in circles. Even when we have the occasional film seconds when Knightley is not in the framing, the scene pans to Elizabeth’s presence. It’s as if the camera leads us back to her. The maid carries items through the Bennet household and ends up in Elizabeth and Jane’s shared room. The intimate scene of Mr. and Mrs. Bennet’s bedroom guides us to another meeting between Jane and Elizabeth. Darcy’s appreciation of Georgiana’s pianoforte skills lead the viewer to Elizabeth’s accepting his invitation to Pemberley. Knightley’s star power is “lessened” by her appearance in dingy, drab dresses and having her surrounded by a “working” home: animals, a barnyard swing, the kitchen, clothes lines, disarray. These techniques “muffle” Knightley’s beauty and allow the viewer to accept her as Austen’s most famous character. 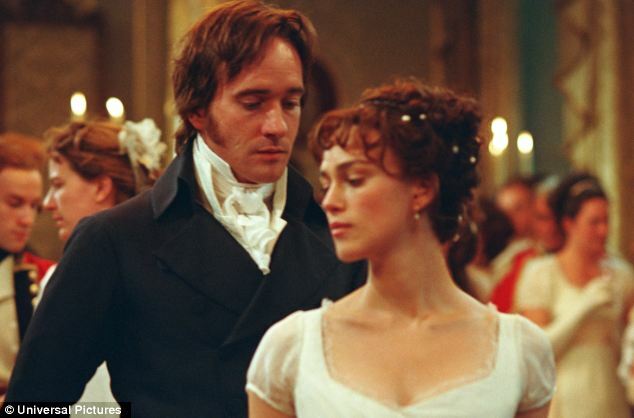 In contrast to the 1995 film, Matthew Macfadyen’s Darcy is often shot from a distance and always fully clothed (minus the American ending again). Even his open-shirt appearance in the pre-dawn hours is viewed from Elizabeth’s point of view. He’s coming to her. She waits for him. Therefore, she remains the center of attention. Wright’s “extra” scenes direct the desire to Elizabeth. Davies’s film showed Darcy in his bath and diving into a pond to increase Colin Firth’s role. Wright uses the near kiss from Darcy’s first proposal, the caress as Darcy assists Elizabeth to the carriage, and the seductive circling of Darcy and Elizabeth at the Netherfield Ball as part of the film’s sexual subtext. These and several other scenes amplify the desire for Elizabeth. One part of the film that has received much criticism is the way this adaptation minimizes the relationship between Elizabeth and Wickham and between Elizabeth and Colonel Fitzwilliam. Wright chose to omit Austen’s diversions because Elizabeth is the one to be desired, and Elizabeth desires Darcy. In this version, we do not consider her flirtation with either man as serious possibilities. In the 2005 film, Wickham spends more time with Lydia than he does with Elizabeth. Okay, it is your turn. Where else in the film is Elizabeth the point of desire? How has her character been created? I have other ideas, but I am waiting for our Miss Austen’s loyal fans to add their own opinions. 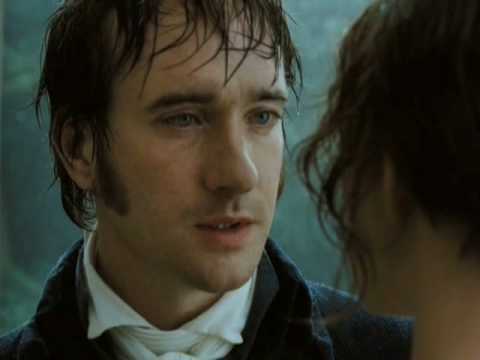 This entry was posted in Austen Authors, Great Britain, Jane Austen, Living in the Regency, Regency era and tagged Elizabeth Bennet, film adaptations of novels, Joe Wright, Matthew Macfadyen, Pride and Prejudice 2005. Bookmark the permalink.